Engineers have successfully removed the work light knob – embedded between the pressure pane on Atlantis’ pilot window and the dashboard panel – late on Monday night, after pressurizing the orbiter to aid its liberation. Meanwhile, a cart full of payload bay equipment has fallen off a truck, leading to evaluations on the state of several longerons that were heading for installation into Atlantis. 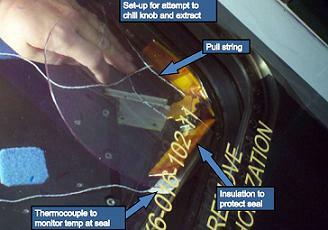 Engineers had an array of options to remove the knob, with a plan to use the least intrusive – and subsequently less damaging to the window pane – methods, in the hope of avoiding a requirement to replace the pressure pane, which would result in a standdown of the orbiter for up to six months. Late on Monday, a technician, an engineer, and a SpaceCraft Operator (SCO) entered Atlantis, ahead of a slight pressurization of the orbiter. It was hoped that the slight expansion of the flight deck under pressurization will help free the knob. However, Atlantis can only be pressurized to a maximum of 3 psid, compared to the 14.7 psid on orbit. Dry ice was again used to try and shrink the knob to aid it’s removal, although an opening attempt using this method failed. “Plans for Window 5 have been developed, to remove the knob that is wedged between the panes. The crew module will be pressurized during second-shift (ends midnight) on Monday, in an attempt to dislodge the knob,” noted processing information on L2. “Preps to configure the crew module for pressurization are expected to be completed 1st shift today with testing to begin on 2nd shift. The successful removal of the knob late on Monday night has been confirmed, although several opening attempts failed to liberate it. “The pressurization of the vehicle and cooling did not remove the knob. The vehicle was pressurized 3.7 psi above ambient to 17.87 psi. The knob was cooled with slugs to -9 deg F. Other options will be discussed to remove the knob,” noted an opening log report last night on L2, prior to success being noted at the end of the second shift. Evaluations into whether Atlantis will require the replacement of the pressure pane are now taking place, with proposals of new inspection methods – and a special inspection tool – under development this week. Small areas of damage have already been observed where the edges of the knob are embedded into the pane, although engineers are hoping the borescope images are showing mainly cosmetic damage, as opposed to a breach of the pane’s safety criteria. “Discussions were held with OPO on how best to remove the knob from Window 5. Borescope inspection reveals that the knob is wedged between the panes and may have already done damage,” the Orbiter Project Office (OPO) noted ahead of rhe removal on the Shuttle Standup/Integration report (L2). “After the knob is removed, in-depth inspection must be performed to determine the extent of damage to the window. If the window must be R&R’d, it will result in a very long downtime (worst case estimates range as far as six months). It has been confirmed by shuttle management that a spare pressure pane for window 5 is in stock, while long lead items such as associated seals are being looked into. Should evaluations call for the replacement of the pane, Atlantis is likely to be removed from STS-129 duty due to the length of her standdown. Contingency planning is already taking place into handing the flight to Discovery. Although a stretching of the manifest is unavoidable, the main area of discussion relates to Discovery breaching her eight flight OMDP (Orbiter Maintenance Down Period) limit. This limit is based on a timeline that was extended in 2007 to allow the fleet to fly out the remaining missions on the manifest, without the one year standdown for their scheduled OMMs (Orbiter Major Modification) periods. Back in mid-2007, engineers devised a priority list of work that was required on Atlantis, creating ‘mini-OMDP’ processing which could be conducted inside the OPF during regular post and pre-flight flows. Atlantis originally had no choice but to retire in 2008, given she was due for her overhaul in that year, which would have been deemed pointless as she would be returning to flight status near the end of the shuttle program. The original plan back in 2007 was to retire Atlantis into a spare parts donor to her sisters after arriving back from STS-125. However, engineers designed the ‘3 year / 8 Flight OMRSD (Operations Maintenance Requirements Specifications Document) Review’, which created the option to extend orbiter’s flight status in-between OMDPs to eight flights and five and a half years – instead of the previous three years. Only Endeavour was able to fly until 2010 under the previous definitions. Following PRCB (Program Requirements Control Board) approval, the FAWG (Flight Assignment Working Group) handed two “extra” missions to Atlantis, thus reducing the burden on Endeavour and Discovery. The Space Shuttle Program (SSP) also successfully argued the importance of flying out the schedule with three orbiters, so as to ensure an on time transition of shuttle resources to Constellation, ultimately resulting in NASA approval of the plan. However, the incident with Atlantis has now switched focus back to Discovery, with the addition of STS-129 – should Atlantis’ pressure pane require replacement – breaching those refined OMRSD rules. “If a ninth flight is required for OV-103 (Discovery) to complete the manifest, we run into issues with the mandatory OMM scheduled after its eighth flight,” added the Orbiter Project, via the Standup (L2). “The current manifest does not afford room for an OMM. Initial work is in progress to determine what items can be waived or pushed off to a later date and what work will have to be slotted into the flows as time allows. Evaluations are taking place on several items of payload equipment that fell of a truck that was transporting the hardware to Atlantis’ OPF last week. The cart contained several structural beams – known as longerons – that are installed between bays for supporting payloads. 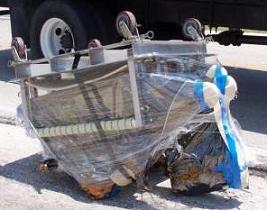 “During transport of the longerons for OV-104 (Atlantis), the work cart holding the equipment fell off of the truck. The Accident Investigation Team reported immediately to the scene. Payload Engineering also responded to monitor lifting and securing the cart,” noted processing information on L2 late last week. It is hoped most of the hardware is still acceptable for flight, and subsequently will not become a schedule impact to STS-129 – regardless of the evaluations into Atlantis’ Window 5 pressure pane. “Initial evaluation to the manifest impact shows two of three longerons available (missing the Bay 10 Starboard), and one of three latches are available (missing the Bay 6 Starboard and Bay 10 Port),” added the report. “The Bay 10 latch is a standard weight latch, but there is a middleweight latch available. “The Bay 6 latch is a lightweight item, but there is a middleweight latch available. This issue will be worked with the Engineering Community to see if these are acceptable. Worst case outcome at this time is for the Bay 10 Starboard longeron. The incident is understood to have occurred when the truck turned a corner just outside the OPF buildings. The cart wheel’s locking system is believed to have failed.